Corrugated board displays are the first choice when it comes to POS promotion. According to a study conducted by the EHI Retail Institute, almost all German retailers use this type of display to boost sales. Retailers and consumer goods manufacturers alike value this readily available material, as it can come in a variety of shapes and can be quality printed, which makes it the ideal choice for branding promotion and increasing sales. “Thanks to its rugged design, the display can hold heavy gourmet products such as bottles, cans and entire box bottles, cans and entire box units without difficulty”, says Schmidlin. Another forte of the display is the effective presentation of goods at the POS: products are in plain sight and can be reached from two sides. Using an additional pallet jacket, the displays meld into a single visual unit ‑ the icing on the cake in every powerful brand staging experience. “Boosting sales was our main concern,” explains Schmidlin. “In addition, with the Real Thai world of experience we attached great importance to giving consumers a genuine Thai atmosphere. All of these requirements are thoroughly met by the groundbreaking Real Thai Push & Ready design. In June 2013 the display won Gissler & Pass the gold award at the POPAI (Point of Purchase Advertising International POS Awards) in the “Food ‑ Temporary” category. Fissler, the old-established manufacturer of cooking utensils, has, together with its partner from the corrugated board industry, developed a combined transport and sales packaging that is adapted to the special requirements of the Asian market. The pressure cooker packaging of Fissler cuts a good figure in ship containers and in the shops of Hong Kong, Singapore and others. For this, Heyer has called upon in-house experts and the corrugated board specialist Gissler & Pass. 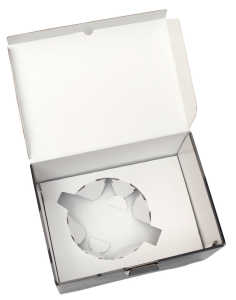 The packaging developer designed a robust single-piece folding bottom packaging made of B-flute that can be used in modules. The whole interior consists of sturdy E/E-flute with a high proportion of Kraftliner. “The core part is a mechanically glued-in insert with a circular indentation, with which the goods are kept in place”, explains Dominik Schröteler, Packing Developer at Gissler & Pass. “This fixing is designed so that it can secure up to 19 different pressure cookers and sets against sliding. They can, after all, weigh up to 10 kg.” For additional protection during transport, a corrugated board strip over the pressure cooker provides equalisation of height. Finally, a support for the packaging lid, in the form of a corner curving inwards, ensures that the lid does not cave in. “An important advantage of the packaging is the simple handling”, says Schröteler. “The folding bottom, the centring insert and the support automatically move into the right position when the packaging is set upright – the whole setting-up is done with a flick of the wrist.” With the old packaging solution, each pressure cooker first had to be provided with protective padding before it was placed in the packaging. This caused costs: placing in the packaging lasted considerably longer because a large number of work steps had to be carried out one after another. In addition it was necessary to buy lots of padding components, which had to be stored and kept ready at the workplace. “The improvement of the packaging brought us a substantial cost advantage”, confirms Dr Andreas Hillenmeier, Development Manager at Fissler. The high-quality premium look is decisive, because as well as safety during transportation, the packaging should also ensure an impressive brand appearance. 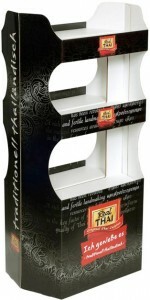 The high-quality looks of the packaging design appeal especially to the Asian audience. Heyer: “The Fissler brand has achieved the status of a luxury brand in Asia; its valuable design thus makes the sales packaging an important marketing instrument.” The Asian subsidiary companies of Fissler have been intensively involved in all questions of design, in order to cater to the requirements of this market. “This attractive packaging has a strong sales-promoting function in Asia”, adds Heyer. In retailing it is now more important than ever to establish direct communication with the consumer and anyone who wants to penetrate into the awareness of the customer has to stand out and appeal to the senses. The POS is thus playing an increasingly important role in brand strategy. This has also been recognised by the electronic appliance manufacturer Severin, based in Sundern. Two years ago, Severin decided to pep up the image of the brand and of the long-established company. In addition to a new corporate design and new brand claim, the company is also presenting itself with a new packaging concept. Together with the packaging specialist Gissler & Pass, Jülich, the new image was implemented in modern, high-quality-finish packaging for the “Home Selection” line for specialist retailers. “Because this is a premium line from our company, which rounds off the range at the top end, the packaging was meant, above all, to stand for premium quality as well as providing transport protection for international shipping”, says Simone Scharfschütze, Marketing Manager at Severin, summarising the task. Thanks to more than 30 years of cooperation, Severin and Gissler & Pass are a closely knit team, in which there is clarity regarding the requirements of the brand item manufacturer and the technical printing and finishing options of the corrugated board company. Without bottlenecks, a packaging design was put together in a few months, from the idea to the introduction on the market that contributes to reinforcing the brand’s emotional charge and achieves a recognition effect with customers. The packaging for e.g. coffee machines, which has the basic colour black, already looks trendy and refined in itself. The 5-colour offset printing is additionally enhanced by the drip-off varnishing. The drip-off varnishing process is a two-stage inline improving printing process with which one can produce effective matt-gloss contrasts in the offset printing machine. Due to the variation in the type of surface and the contrast between matt and gloss areas, a variety of visual effects can be achieved, such as a velvety appearance or reflective prints. In the Severin packaging, this finishing technique ensures that the glossy picture of the product stands out from the matt black background and immediately catches the eye of the consumer. “Retail, as our direct contact, has reacted very positively to the packaging solution and explicitly praised the high quality”, confirms Simone Scharfschütze. “The concept shows once again that premium packaging is no longer a privilege of luxury brands but instead that segments such as consumer electronics can also leave the outdated and well-worn paths in order to awaken the customers’ interest and to boost sales with a striking outfit for their products”, says Thomas Gissler-Weber, Managing Director of Gissler & Pass. When introducing new products, displays made of corrugated board have their big appearance at retail sales outlets. This was also the case with the German market launch of “Listerine Total Care” and “Listerine Total Care Sensitive” from Johnson & Johnson GmbH. The shop displays with the brand image are intended to draw attention and encourage shoppers to buy the new mouth care solutions. This was the development order from the consumer goods manufacturer to the packaging experts of Gissler & Pass. “The aim was to create something special”, is how the requirements were summed up by Lutz Werner, Packaging Developer at the corrugated board manufacturers in Jülich. The fact that he succeeded is not only proven by the successful market introduction. Prizes from national and international packaging awards are also testimony to this success. “In the designing of the display, we were meant to use the shape of the Listerine bottle as a guide”, says Werner, describing the task. Accordingly, in the first design step, he developed a 3D model that adopts the brand-typical outline of the product packaging. Three corrugated bottoms placed one above the other carry the mouthwash bottles, framed by strips of the same material. The roof of the display consists of corrugated board elements arranged in a cross, in the lilac of the bottle body and the black of the twist-cap. The result: a sales area in the shape of a Listerine bottle. “This design idea for a display was completely new”, explains the developer. In order to allow as much free access to the products as possible, side walls were dispensed with. This resulted in special requirements for the stability, because when it is fully loaded, the 1.70-metre-high design has to carry 72 half-litre bottles, each weighing 600 grams, giving a total of 43 kilos. A particularly sturdy corrugated board made of 3mm-thick B-flute and a back wall connected to the product-bearing corrugated board bottoms provide the necessary stability. “The product is free-standing and bears itself due to its weight”, elaborates Werner. 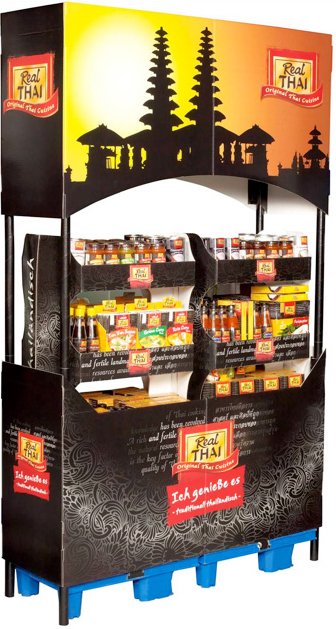 The offset-printed display has been in use in food retailers and drugstores since 2010. With success: within the last year Johnson & Johnson GmbH significantly increased its market share in the mouth care segment with Listerine products. The manufacturer attributes a large share of this development to the innovative shop display which now stands on the sales front for several Listerine products in Germany, Austria and Switzerland. Based on the same design principle, there is now also a version for 36 bottles instead of 72. Apart from the users in the trade, the new development also impressed the jury of the German Packaging Award. It awarded a prize to the sales-promoting design in 2010 in the category “Promotional and Display Packaging”. “The offset laminated corrugated card promotional display impresses with a design very close to that of the product”, judged the experts and particularly praised the combination of high brand recognition value and very good product access. As a prize-winner of the German Packaging Award, the display was also entered in the WorldStar competition of the World Packaging Organization. Out of the roughly 250 entries from 30 countries only nine innovations received an award and the oversized mouthwash bottle was among them.